What could we do on our little campus to foster interfaith solidarity and to bring comfort to two minority religious communities whose members are likely sad and anxious about bomb threats at JCCs and reports of rising Islamophobia? "I'm deeply distressed at the desecration of Jewish cemeteries," said my colleague Sharif at the weekly chaplains' staff meeting at our small liberal arts college. "I'm deeply distressed by the mosques set afire," I said to him in return. We both find hope in stories of interfaith solidarity across what can be a contentious divide between the children of Ismail and the children of Yitzchak . We've read about Muslims raising money to repair Jewish tombstones, and Jews raising money to refurbish torched mosques, and we take heart from those things. But what could we do on our little campus to foster that spirit of interfaith solidarity and to bring comfort to two minority religious communities whose members are likely sad and anxious about bomb threats at JCCs and reports of rising Islamophobia? The answer turned out to be powerful and simple: pray in each others' religious spaces, with and for each other. Our ritual began in the Muslim Prayer Room in the basement of the large stone church on campus. A few dozen people doffed shoes and sat in a circle on the lush prayer rugs. We were Jews and Muslims, Protestants and Catholics. We also spanned generations: we were faculty and staff, college students, and a handful of staff and faculty children. Then the Jewish student led us in a Minchah service, because it was the hour for afternoon prayer. We read a translation of the Ashrei aloud in English, and then rose for silent prayer. Some of us used siddurim to daven the weekday Amidah in silence. Others offered the silent prayers of their own hearts. The non-Jews among us held respectful silence as we prayed. After we sang Oseh Shalom to invoke peace, I mentioned Rabbi Abraham Joshua Heschel who famously said, of marching for civil rights in Selma, that he was "praying with his feet." I invited us to walk across campus in that spirit, and we filed out of the Muslim Prayer Room to don shoes and walk to the Jewish Religious Center. By then the afternoon was giving way to twilight, and the little boys with us whooped and raced down the sidewalks in the gloaming. In the Jewish Religious Center, after I offered a word of welcome, we welcomed the Muslim community to pray in our sacred space as they had welcomed us to pray in theirs. Those of us who were not praying stood in the margins and held space for those who were worshipping. Watching members of our small Muslim community at prayer felt intimate and powerful. I remembered the first time I ever experienced Muslim prayer, more than ten years ago, in a similarly interfaith setting. I felt privileged to bear witness, and moved that this group was willing to enter into prayer with us in the room. After the maghrib prayers were complete, a Muslim student from Yemen spoke from the heart about how meaningful it was for him that non-Muslims created this safe space for him so that he could pray. "...Let our voices resound in the heart beat of our peoples. Let our hopes resound in the pulse of our longings. Bless those who are here. Bless those who stayed away..."
As I left with my son, people were standing in clusters, meeting each other and talking. I know that our interfaith ritual of prayer and solidarity doesn't change the things that are broken about our world. But it was a powerful reminder for me that in a time when divisions seem deep and hatred runs high, we can make the profoundly countercultural choice to stand with each other, to care for each other, to open our sacred spaces to each other, and to pray for and with each other. 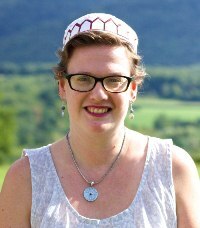 Rabbi Rachel Barenblat, named in 2016 by the Forward as one of America’s Most Inspiring Rabbis, was ordained by ALEPH: Alliance for Jewish Renewal as a rabbi in 2011 and as a mashpi’ah ruchanit (spiritual director) in 2012, and now serves as co-chair, with Rabbi David Evan Markus, of ALEPH. Author of 70 faces: Torah poems (Phoenicia Publishing, 2011) and Open My Lips (Ben Yehuda Press, 2016), among others, since 2003 she has blogged as the Velveteen Rabbi. She serves as spiritual leader of Congregation Beth Israel and as interim Jewish chaplain to Williams College.